Smartphones, tablets, apps and online… the future is mobile. Much like the Internet of the early 1990’s, mobile is blowing up into the mainstream, and before too long people will be asking about the app for your business. And just like you wouldn’t dream of not owning a domain for your business, it won’t be long before not having a mobile app looks bad. Whether you need a brand new app or your current one updated, or even if you just have questions about how to navigate through the current mobile landscape, SeeClear Tech has the power and experience to bring your mobile dreams to life. 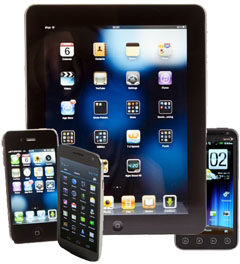 iOS, Android, Blackberry, Windows mobile… all are possibilities. If you want to get your business into the world of mobile, contact SeeClear Tech and let’s figure out how to help make that a reality.